Music is the best thing to enjoy in spare time or when you are getting bored. Most of the people used to enjoy music while performing their routine task. Everyone from us wants to get the best quality of sound to enjoy the favorite music. We want to have the best quality sound either listening to music through speakers or headphones. Enjoying music through headphones is a relaxing activity. But some professionals need to have a headphone too for their work, which is commonly required for professional recordings or audio files listening purposes. People usually become picky while getting headphones, because they want the headphones with the best quality. A wide range of the available headphones can make the decision of getting the best quality headphones very confusing. So, we have a complete review of Shure SRH1840 Professional Open Back Headphones (affiliate link), to clear many of your confusing points about the product. The Shure SRH1840 is developed with the finest material and high accuracy. These headphones can be ideal for mastering, recordings and audiophile applications at the professional level. Shure SRH1840 has a unique custom and durable design. These headphones are lightweight enough that you can carry them with you easily. You can enjoy your favorite sounds or can perform professional tasks uninterruptedly. You will get a storage case with the headphones. Availability of additional cable with the headphones can assure you that you will not be interrupted due to cable issues while using Shure SRH1840 Professional Open Back Headphones. These headphones are individually matched with neodymium drivers of 40mm to enjoy unparalleled auditory files. This will result in a smooth and natural sound with high-end bass. These are open back headphones. A circumaural design of the headphones allows the user to experience natural sound effects. The design of the headphones helps to increase the depth of field. One of the best features that these headphones have is its capability of being connected with the amplification system for any external headphones. 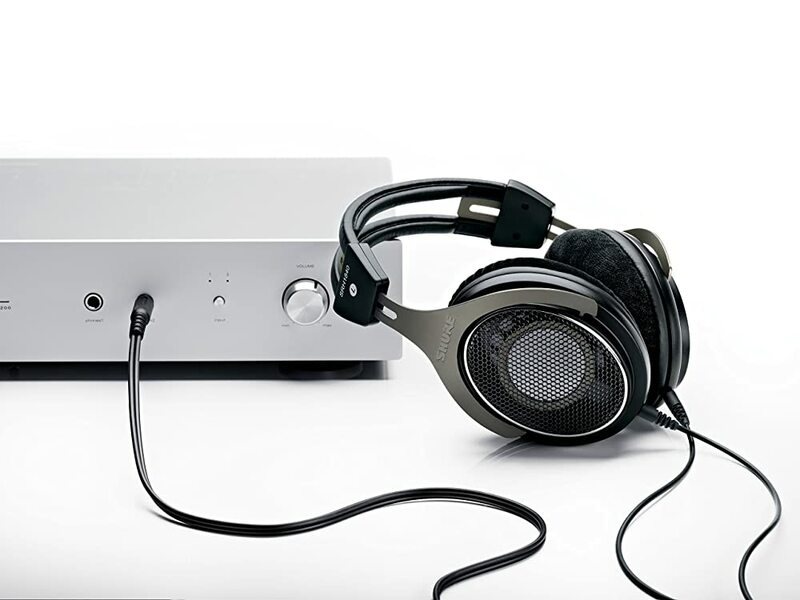 These headphones are best optimized for connecting to external amplification resources, due to which user can get an enhanced experience of sound. Shure SRH1840 headphones have dual exit cables which are heaving gold-plated MMCX connectors. These dual exit wires ensure a secured connection. The cables are detachable, due to which they can be stored comfortably. While performing any professional activity, a secure connection can be the utmost priority of someone. So, it is better to adopt the headphones that provide high-end secure connection to you. 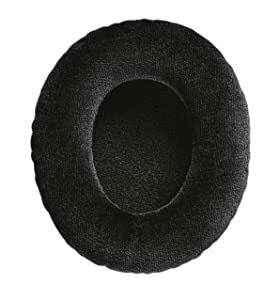 Velour ear pads come with a high density and slow recovery foam that is comfortable for ears. These velour ear pads are replaceable. While having headphones, you need to select the most comfortable headphones. This is because, if you have to use headphones for your work, you may need to use them for hours. Shure SRH1840 headphones (affiliate link) have soft ear pads and adjustable settings that can provide you with a comfortable experience for hours. Easy control features of the Shure SRH1840 headphones can be the biggest reason to buy it. These are adjustable headphones; it means you can control the size according to your requirements. It provides the easiest control functions; you can learn these functions easily. Shure SRH1840 headphones allow you to enjoy music or perform any other professional activity without any disturbance. There are no hard settings to use the Shure SRH1840. The Simple settings can never make it hard for you to explore the features of these headphones. You can attend your calls too while using the headphones when attached to your mobile phone. The most important thing to focus on while selecting any headphones for your professional or personal use is the quality of the sound. There are some enhanced features available in today’s technology, but you can’t compromise on the quality of sound over them. Steel driver frame along with a vented centerpiece of the pole can enhance the linearity of the sound and can eliminate internal resonance, which can let you enjoy the consistent performance at different levels of listening. Due to the advanced technology of the Shure SRH1840 headphones, they can be an ideal headphone for the studio professionals too. Because they provide natural and clear sound these can be the best to use for them in the sessions of critical mastering. The user will get an extra pair of replaceable ear pads. A detachable cable will be given with it that can allow you to enjoy uninterrupted music. Best for both music lovers and professionals. Wires are detachable, that can make its storage easy. Durable storage case that you can use to keep the headphones safe. It has no control buttons on the side. It is based on wired technology. Shure SRH1840 Professional Open Back headphones (affiliate link) are reliable and can provide the best experience to the user. It can be used both for personal or professional needs. They provide the best sound effect so that studio professionals can also use them for their multiple critical mastering sessions. These are highly comfortable that you can wear them for hours without getting painful on your head. Overall a great pair of headphones.